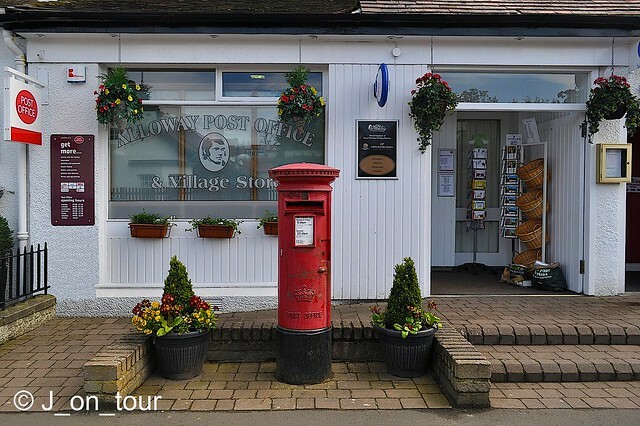 J_on_tour: Alloway, Ayrshire (Burns Country). It is coincidental, unbelievable and yet poignant on this day (Burns night) that the next stage of my journey should be from the heart of Burns country. Despite images taken over several days from the previous (Irvine) post, you may re-call me telling you that the weather wasn't good and the forecast was worse for the afternoon. I hadn't travelled far from the hotel to The Scottish Maritime museum on my first day and didn't intend to hang around looking in a shopping centre or getting wet, so the world (or rather Ayrshire) was my oyster. When I looked up into the sky, it was a no brainer to choose somewhere in the south of the region as there was glorious sunshine in that direction. From the few options available, Alloway and Ayr seemed the least expensive as an afternoon filler with plenty of variety. 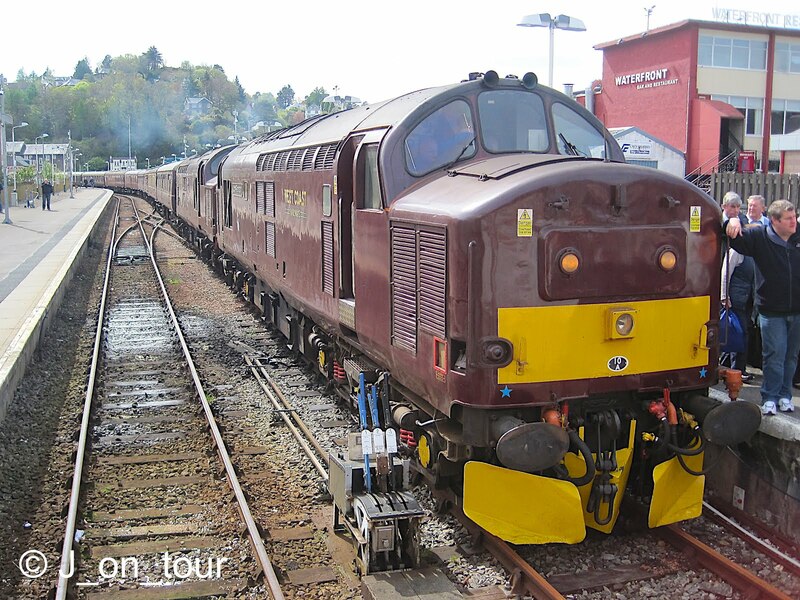 I had been to these places a few times before, usually on a North East Railtours day out from home and on one other occasion when I stayed in Ayr for a week many years ago. Having not been here in digital imagery before, it was a great opportunity to experiment and display some of the most photographed scenes in South West Scotland that viewers will either recognise or want to see, hopefully with my take on it. 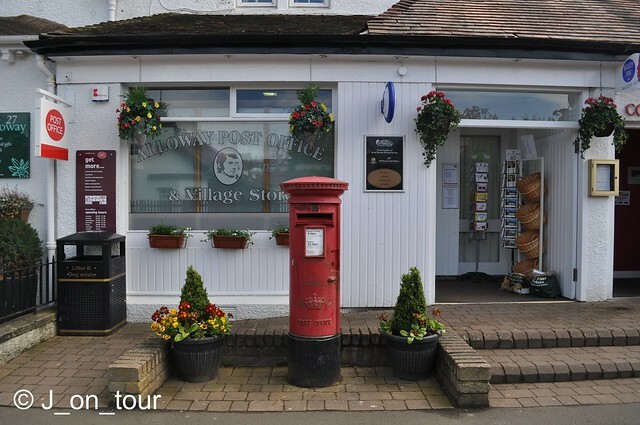 I'll start off with a photographers technical moment for those who like that sort of thing also because the only image I captured of Robert Burns was in one of the few shops in Alloway, the Post Office and village store window. 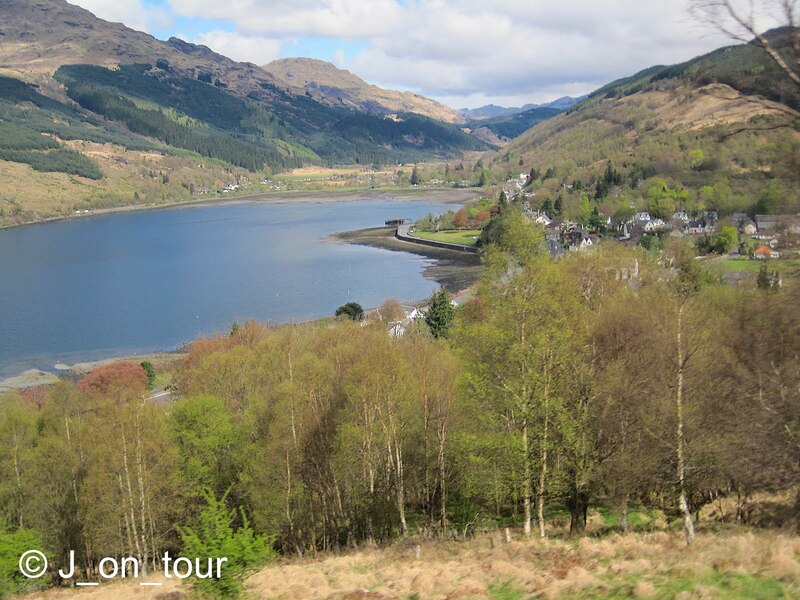 This is the scene across the road from the famous title image of Burns Cottage. I don't usually do a lot with extreme editing but for those that know me on here, I played about with this one in Photoshop and Aperture for a couple of reasons. Originally shot in 18mm (image 1) due to the obtrusive parked cars including my own in a 30 minute free car parking space, the first image had distortion removed with the perimeter lines much straighter and cleaner particularly noticeable in the roof and the steps. I'm a glutton for punishment when it comes to red subjects and the resultant colour popping, so I opted for the Postbox and sign. Then again one of the things that attracted me to the scene in the first place was the colour and flower basket display, so I added that back in. Photography or rather photo editing can be so confusing to the mind at times with the final image not the dramatic result I thought it would be, consequently I prefer the third one from these four. 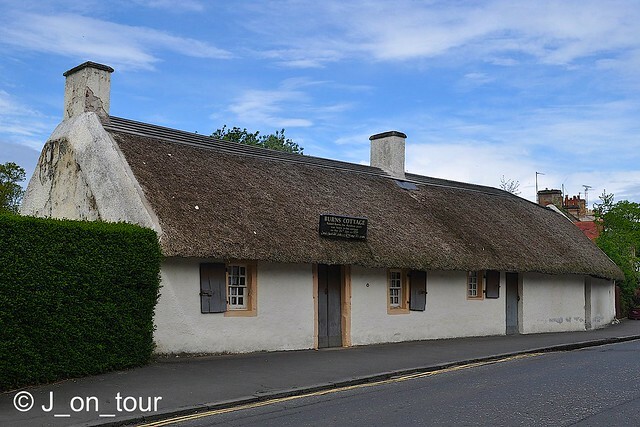 Robbie (Robert or Rabbie) Burns was born in this cottage in 1759, two years after it was built by his father. The family lived here for another seven years before his Father sold the property to become a farmer. 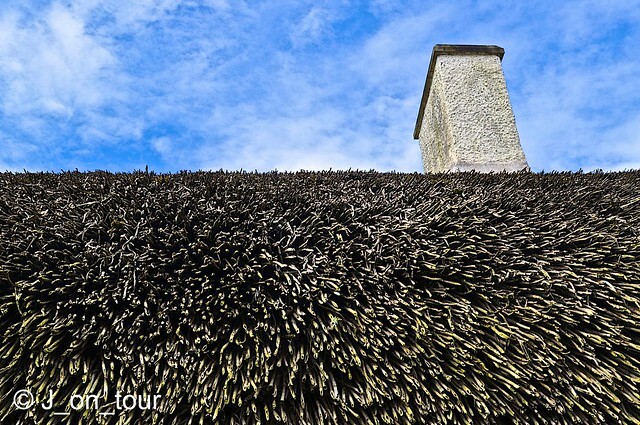 The restored two roomed thatched cottage is now part of the Burns museum collection and an integral part of the village of Alloway and possibly one of the most visited sites in south west Scotland. Back in the day after Burns had gone, an entrepreneur ran a public house from the premises, no doubt attracting additional tourist trade and subsequently with the building growing with importance, the Suffragettes attempted to set fire to it to promote their case. The English Poet John Keats visited the property in 1818 and waxed lyrical about the building concentrating more on it's romance and beauty rather than the hardship that was suffered within. 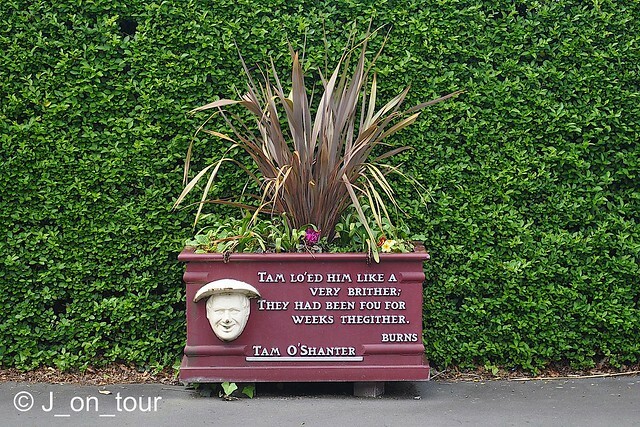 Tam O' Shanter plant pot !! 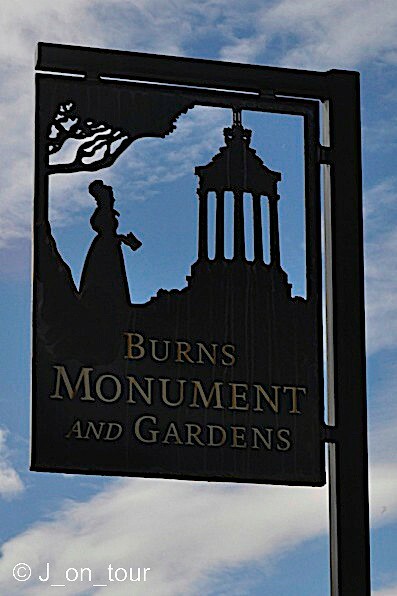 Moving a very short journey south in the car to the outskirts of Alloway, not only did I arrive at the capital of Burns Tourism but the capital of signs as well ! The signs that marked the different sites were impressive, although I didn't have enough time to wait for the pure blue skies as a backdrop. 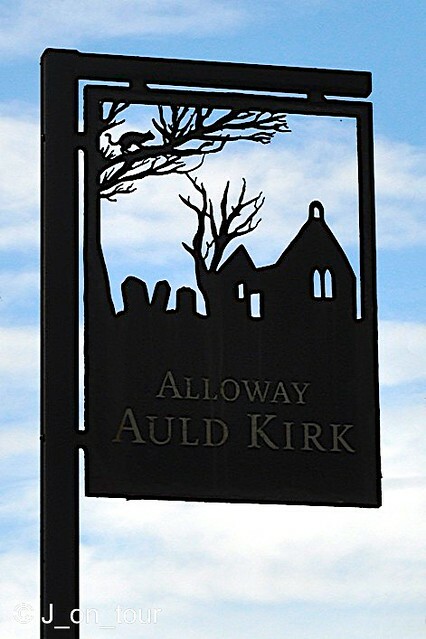 The Auld Kirk Alloway and William Burns grave. By special request as a result of a comment from Cranberry Morning below, I inserted a late image of The Auld Kirk, quite a difficult thing to photograph as a result of the gravestones. There were a couple of reasons why I wasn't happy with this image and consequently left it out of the original post. As you can guess from the sign above, the end of the building is the most prominent and photogenic. Robert Burns father was buried here at the entrance of the grounds. The now roofless 16th century ruin is another setting for a poem mentioned below about Tam O'Shanter. .... who crossed the bridge to safety on horseback whilst being chased by a witch. 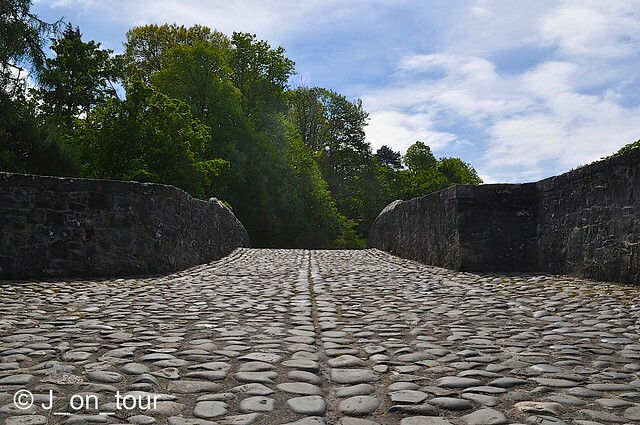 Folklore suggests that the witches were fearful of the cobbled pattern of stones and refused to cross the bridge. 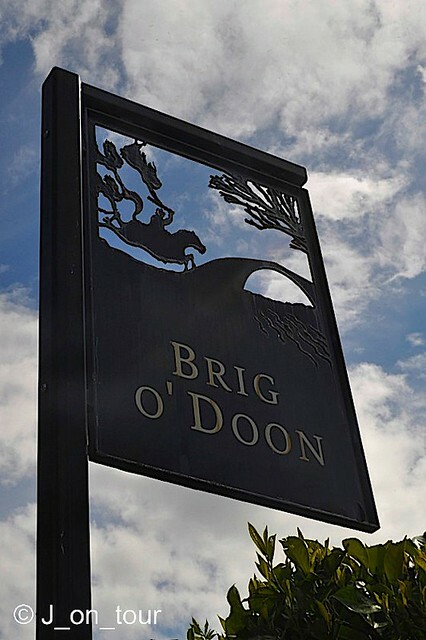 Brig O' Doon was immortalised in a the Broadway and West End musical called Brigadoon where a fictitious Scottish village appears every so often. No doubt a little confusing to those trying to grasp what the real Brig O' Doon or Burns poem is all about. 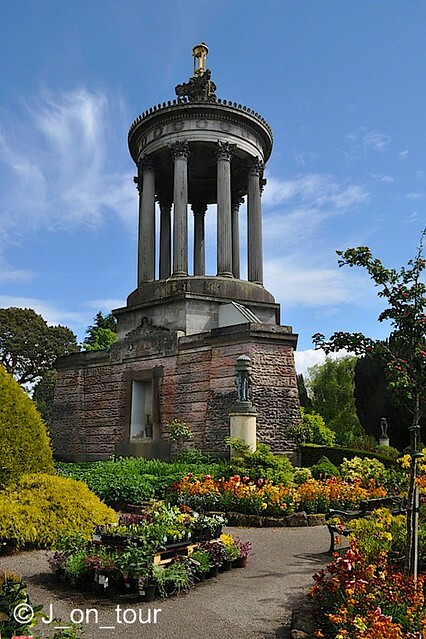 There was inspiration and a competition to design a build several monuments to Burns around Scotland following the construction of a Mausoleum at the Dumfries grave site in 1815. 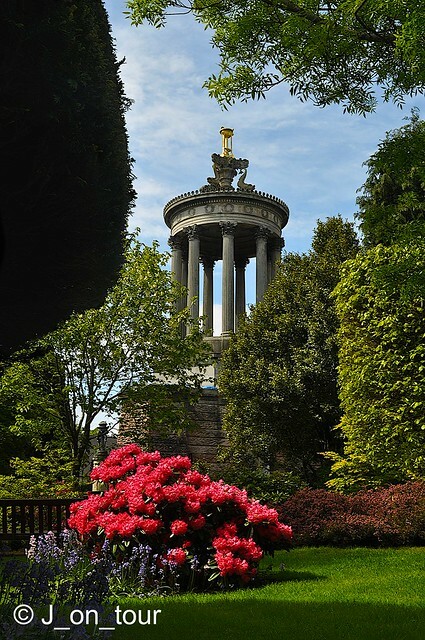 Gothic designer Thomas Hamilton won the competition and this monument was completed in 1828. It was time to head back to the car for an evening meal in Ayr with some cloudscapes and an unusual favourite building (next post). I was wanting to combine the post and conclude with a more humorous sign in Ayr but best not to bore the reader, I know that my posts are far too long anyway ! As an amateur cyclist who has to dismount at Pelican and Zebra crossings, I waited for the traffic lights to change in order to witness this unusual and incredible road spectacle. 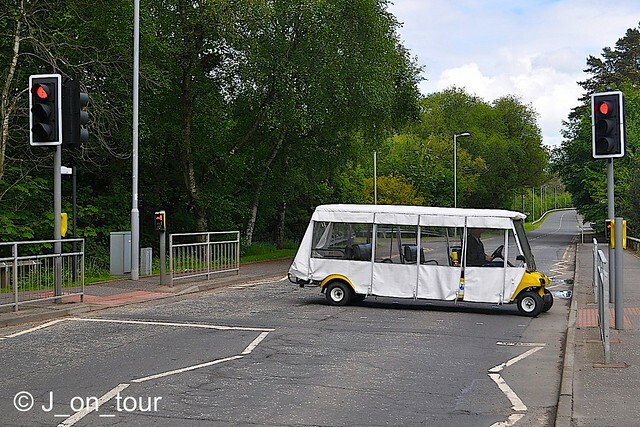 This King of the road in Alloway people mover was off to collect the tourists from The Burns museum (didn't photograph it) and take them to the car park. I was left wondering are pedestrians forbidden to cross here for safety reasons. Love the photos, although I'm not good at detecting the difference between 1, 2, and 3, except for zooming in. Personally, I like the color in photos, unless one goes to all B&W. It seems like the B&W with only a bit of color has become a fad, not my kind of thing. I'd like to see the Auld Kirk and when I read, 'Brig O' Doon,' it took me back to the days of my youth when I was in the musical 'Brigadoon.' :-)) Now I will go look up Brig O' Doon. These photos are beautiful and make me a little disappointed that we didn't go for the Britain train passes and instead got England train passes (at a much cheaper price, I might add.) 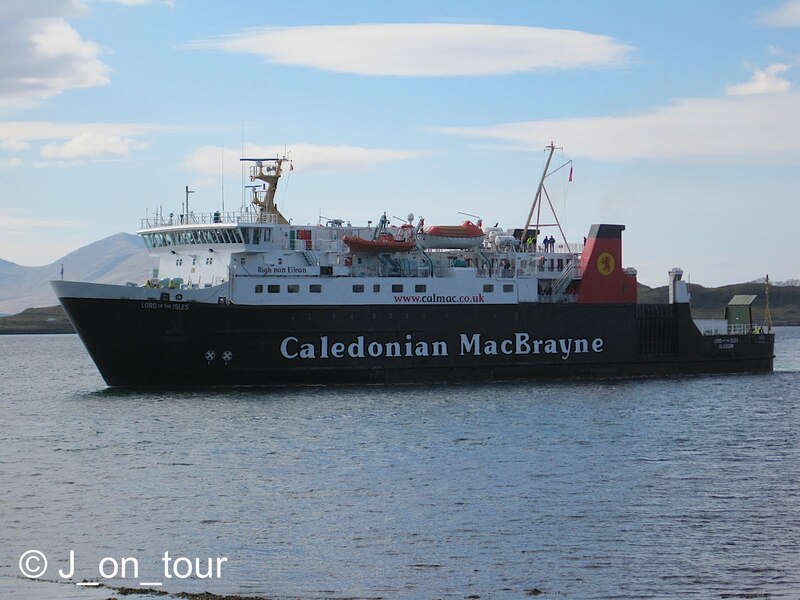 I'll simply have to visit Scotland through your photos, J. Thanks Cranberry Morning, the edges in number 1 on the roof, foreground tile edge, door post to the right and steps to the shop all appear curving. Number 3 has the bin removed. 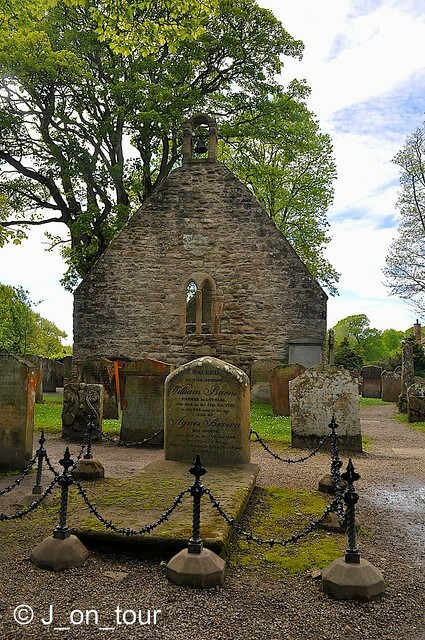 I found and published an image of The Auld Kirk, although difficult lighting in a dark and overgrown graveyard with awkward obtrusive grave stones restricts decent photography. 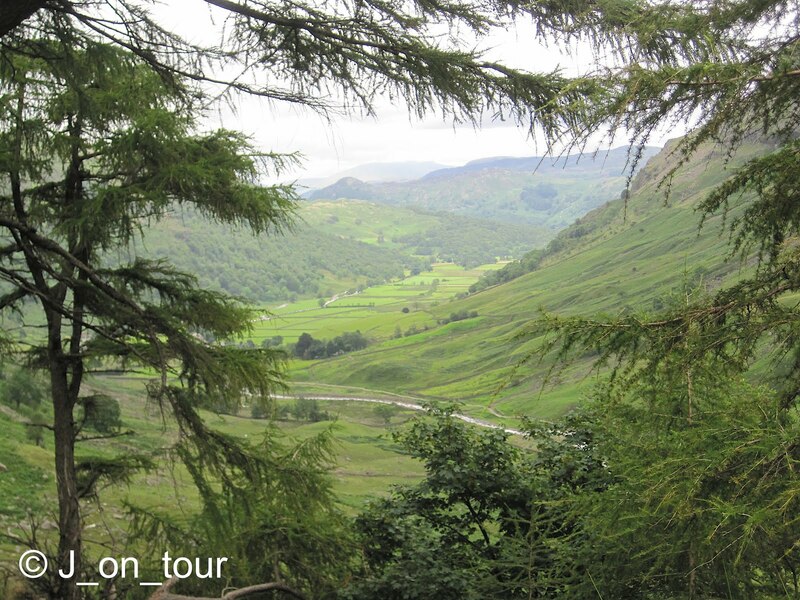 There's only so much you can see in one UK visit as you can stretch yourself into seeing too much but not enough detail. Given your detailed research and preferences, I guess that you might be pleased that you stuck to your original plan. This location mainly attracts ardent Burns fans with passing interest from the average tourist. Not the easiest of places to get to by public transport although there is a bus from Ayr that I have used on a previous occasion as a railway passenger. 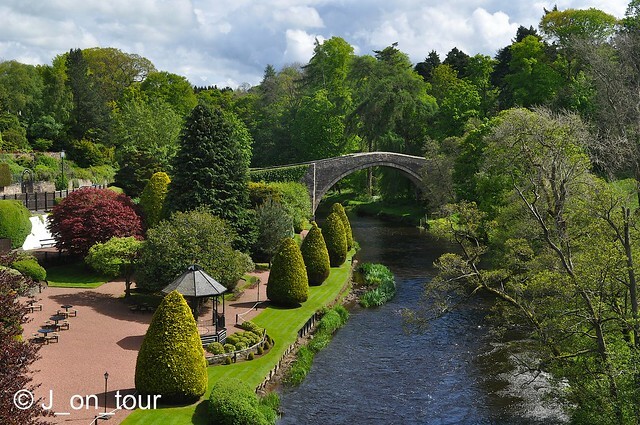 The shots of Brig O' Doon are just breathtaking. So well manicured and cared for. 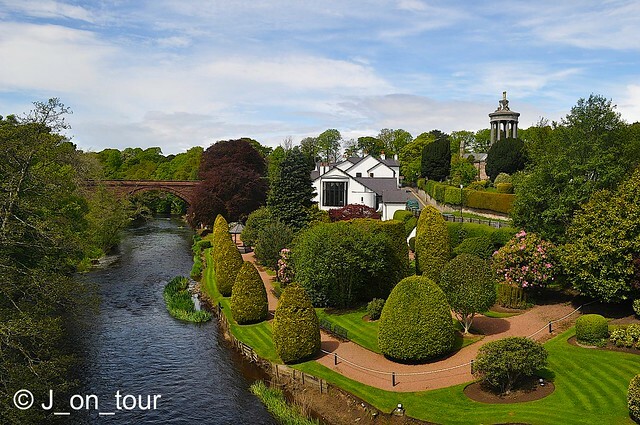 Thanks Michelle, the Brig O' Doon shots were taken from and overlooking the well kept grounds of the main hotel at the location. You can just see a small pagoda on the path running adjacent to the river in which they probably hold events and weddings. As to the photo manipulation.. For me shot 3 gives the most impact of colour and composition. Thanks Cherry Pie for your input. I agree with your choice of image in the photo manipulation. Alloway Post Office isn't the best subject in the world, but I like quirky away from the standard famous shots elsewhere in the post. Thanks for the tailored Literary Tour and your physical efforts to obtain the images J. Thanks Roy, not sure what's most difficult, the composition on the photographic day or getting stuck in properly with the background later !! Great photography and tour, as usual. I am much impressed by your photo efforts, including the editing; I just don't have the patience - or, if I'm being honest, the inclination. But you certainly get some wonderful results. My personal jury is out on Burns the man (for all that). He evidently had a problem controlling himself - not sure if I'm disgusted or jealous. And there's a fair amount of his work that I find excruciatingly awful. But I enjoy Burns night and Mrs Britain (who is a Scot) cooks a fabulous haggis, tatties and neeps! I'm responsibly for the whisky. Thanks Mike, it wasn't my original intention to visit here but I succumbed with the weather and some newspaper style journalism of giving the people what they want to see. I don't buy into the whole poetic culture of the location and possibly think that they just had a bit too much to drink. To me it seems that Burns was somewhere in between thinking outside the box and a trend setting rebel, rather like living a similar rock n roll lifestyle that more contemporary 60's & 70's musicians had. 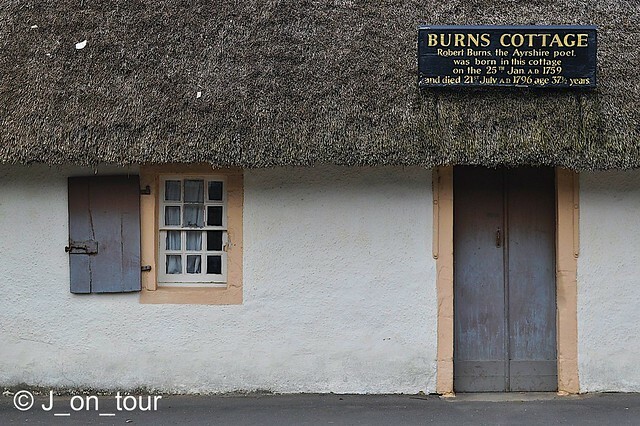 If it hadn't been for the "Address to a Haggis" poem, Burns might only have been a minor tourist attraction nowadays. 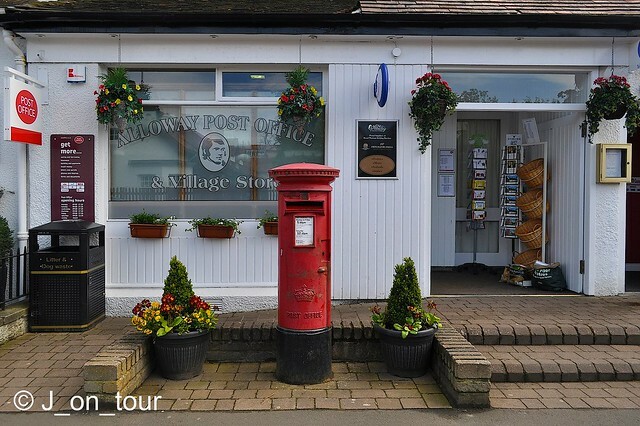 I come to your blog whenever I miss the British landscape or town atmosphere. 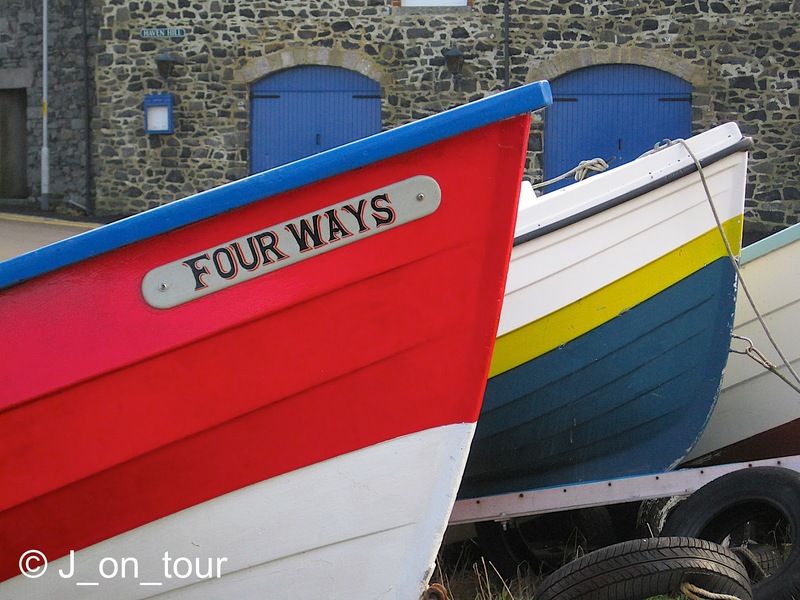 You never failed to enchant me, J_on_tour! Thanks Traveling Hawk, pleased I can give you this pleasure. Thanks Chel, I find Photoshop is difficult as well. I don't do much with it but what I did learn came from YouTube clips. I only use it for straightening vertical lines and removing 18mm distortions. The rest I do in Aperture. 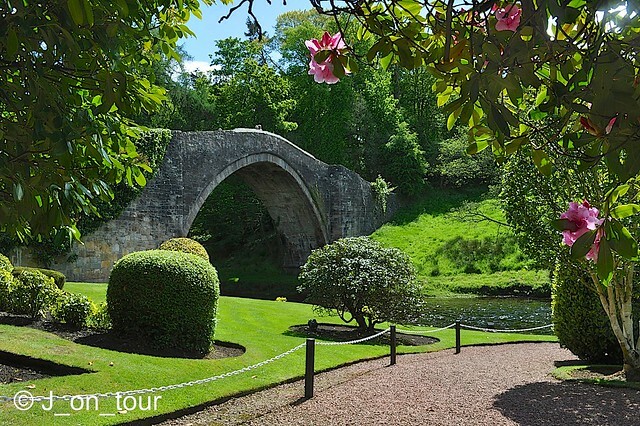 Thanks Petra, the Brig O' Doon garden is part of hotel grounds that would appear to host weddings from some of the nearby structures. I wasn't sure if I would get a great view of the monument from around the other side so I struggled with the bottom of the fence trying to keep the trees at the top of the image from obscuring it. The similar preceding photo was taken later just before the site closed.